United Nations Secretary-General Kofi Annan said on Thursday he was planning to travel to strife-torn Sudan, adding that the UN was pressing the Khartoum government to allow humanitarian workers freer access to Darfur. 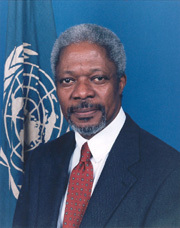 "I myself expect to visit Sudan soon," Annan told reporters at UN headquarters in New York. He called on the Sudanese government to protect its own civilians, saying: "It is the responsibility of the government to protect the population, and we need to encourage it and must insist it does it." Annan added: "We have asked the Sudanese government to take steps to contain the Janjawid militia, who are doing quite a lot of the killing and destruction of the lives of the people in the region." Over one million non-Arabs have been displaced within Darfur, predominantly by attacks conducted by Arab Janjawid militias, who are reportedly allied to the government. The government denies involvement in the attacks. Up to 200,000 people have fled to neighbouring Chad, while estimates of numbers killed vary from between 15,000 and 30,000. According to the US Agency for International Development, a further 350,000 may die over the coming months from a combination of hunger and disease. Asked if the situation in Darfur constituted a genocide, Annan said that, based on reports he had received, he could not at this stage term it as such. But there were "massive violations of international humanitarian law," he added. Last week, US Secretary of State Colin Powell said the US government was considering whether the mass displacements and killings in Darfur constituted genocide. He said the matter was being discussed "inter-agency" and that lawyers and policy officials were looking into it. The Convention on the Prevention and Punishment of the Crime of Genocide - to which the US is a signatory - defines genocide as acts "committed with intent to destroy, in whole or in part, a national, [ethnic], racial or religious group". Such acts include killing; causing serious bodily or mental harm to members of a group; and deliberately inflicting conditions of life calculated to bring about the physical destruction of a group in whole or in part. Annan said he had discussed the Darfur issue with high-level representatives of the Sudanese government during a recent trip to Brazil. Meanwhile, on Wednesday, the UN Emergency Relief Coordinator, Jan Egeland, discussed the Darfur crisis with members of the US Congress, government officials, representatives of US NGOs and others in Washington. He told them that the greatest threat now facing civilians – especially children – was in the form of diseases that would spread if clean water was not available, and urged them to do all they could to alleviate needs created by the crisis. Egeland also met with InterAction, a consortium of humanitarian NGOs, and urged these organizations to redouble their efforts to save thousands of lives in Darfur. During the discussion, the NGOs described the many obstacles they still faced in delivering aid, including slow visa processing for staff wishing to get into Sudan and delays in getting urgently needed supplies and equipment through customs.